Social and mobile are exploding. That much is a given. With the powerful insights and data that social brings to the table, and the far stretching reach mobile offers, when we put the two together we’re left with digital’s power couple. Perhaps these numbers will paint a better picture: on Pinterest 92% of users are logging in via their mobile devices, compared to 86% of Twitter users and 68% of Facebookers, not to mention mobile-only networks like SnapChat and Instagram. Needless to say, social on mobile is definitely where you want to be. 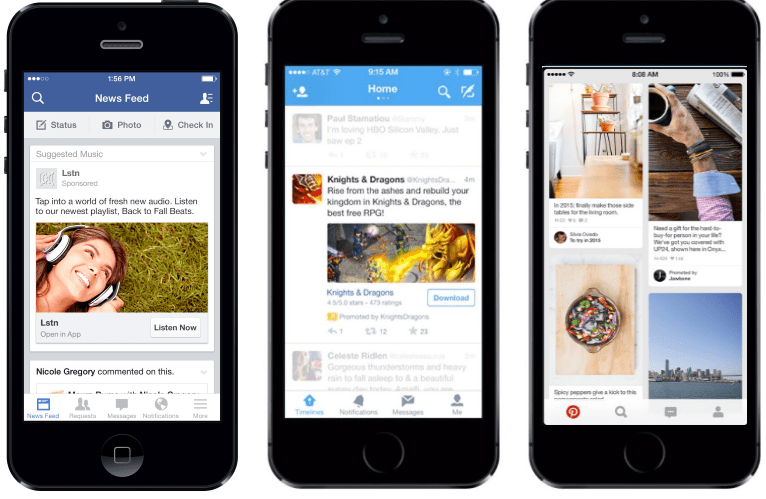 Here are five proven hacks to make your social advertising more effective and meaningful on mobile going forward. One of the most useful aspects of social advertising is its plethora of advanced targeting options – the result of an enormous amount of data that’s unique, accurate and tied to specific users with known interests. What unique targeting options do social campaigns offer that are unique to mobile? Hyper-local Ads: As a mobile marketer working with social media, location based ads will become one of your most powerful tools. Engaging with nearby customers can be extremely valuable whether you’re at an event, an owner of a restaurant, or a brick and mortar shop. 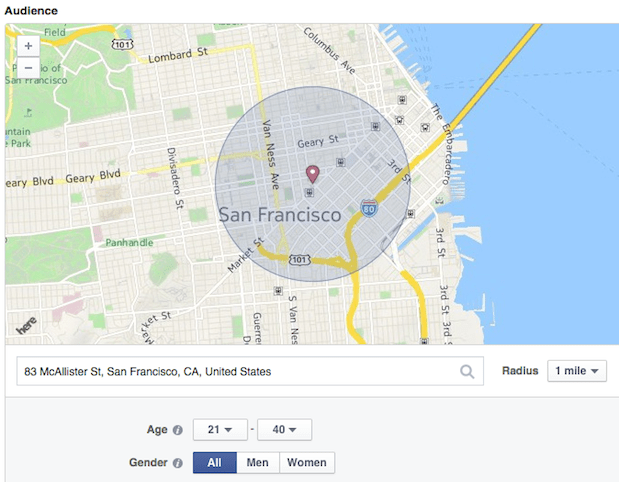 By channeling the GPS capabilities of your smartphone, Facebook and Twitter can help businesses by allowing them to enter the business’ address along with a predetermined radius to notify users in the area. For example, fashion retailers can target users who have an interest in fashion when they are near one of their stores. If they happen to know that a user viewed a stunning new dress in their app, they can retarget that user when she’s near the store by encouraging her to actually try it on. Lots of potential here. Platform & Device Targeting: Another very useful targeting method for mobile marketers is related to the user’s mobile device. 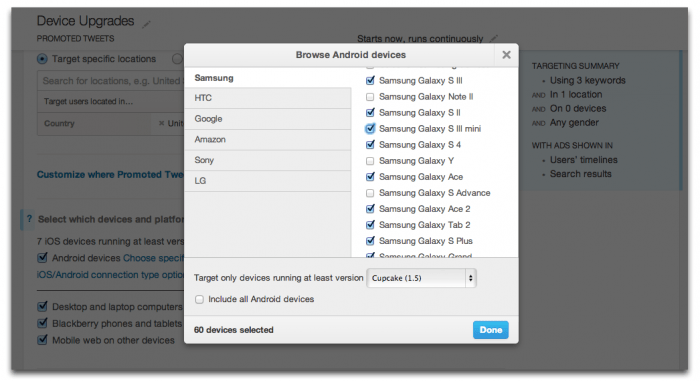 This includes fine tuning based on OS, OS version, device type and model. OS version enables you, among other things, to exclude users with an out of date OS version that may not be compatible with your app or does not perform as well as with newer versions. When targeting by device type, it is recommended to customize your ad using images of that same device you’re targeting. In device model, you should target new phones as the ‘new phone’ market is a great one for app developers as they’re the ones currently on the hunt for all of the latest and greatest apps to fill their 32 GB with. Make sure to optimize your bid for each segment, as competition on prices may vary between different OS versions, device types, and models. This will maximize your ROI by paying the right price for the right audience. Wi-Fi: If your app is heavy, you should only encourage users to download it when connected to wi-fi. By turning this feature on or off, you’re in control. Last but not least, know that there is always a tradeoff between depth and reach. The more granular you target, the higher the cost, but also the greater the value generated. So, if you know your audience, great. If not, you can get a fairly good understanding by investing several thousand dollars, starting wide and letting the social networks’ machine learning figure it out. Native advertising is red hot. By creating ads that are in the same format as the editorial content, marketers are providing a much more streamlined user experience, especially on mobile. According to Yahoo, effectively integrated native ads gained 3X more attention than non-native mobile ads, and a 2.6X higher CTR than other Yahoo mobile display ads. Within native, social will account for the biggest share of ad revenue, according to BI Intelligence. This comes as no surprise as social is perhaps the “nativist” form of native advertising with powerful social sharing tools and an algorithm that most likely increases frequency of sponsored posts liked and shared by your friends. Before choosing where to run your native ad, think hard about which format best suits your product. Facebook, for example, offers advertisers sponsored news feed posts, photo sharing apps like Instagram offer sponsored photo posts, while Pinterest offers sponsored pins. So if you want to advertise design-related products, Pinterest, with its powerful visual platform is a great match. Likewise, if you’re a travel app you can share images of your spectacular traveling destinations on Instagram. If mobile and social are the dynamic duo of digital advertising, video in social on mobile is what makes up the golden triangle. Although more costly, the format’s level of engagement is a world of its own (take Facebook’s video ads that generate 5-6% higher engagement than non-video Facebook ads). Video ads on mobile are already working strong for YouTube, whose users are 1.4x as likely to watch ads on smartphones and also 1.4 times more likely to share the ads they watch on mobile; for Facebook with its whopping 3 billion views on mobile (many of them auto-played but impressive); and for Twitter where 90% of Promoted Video views take place on mobile devices. Pinterest has just introduced Cinematic Pins, which can be classified as a form of video ads. They are a new motion-based mobile ad format that moves during scrolling. If millennials are your aim, social networks like Vine, Instagram, and Snapchat are rising steadily in popularity, with new native video ads expected to be the next big thing. Having said that, it’s important to note that video advertising is expensive and when it comes to creative it’s fairly static. What this means is that you should start running with video only once you already know what you want to say, and what worked for you on other channels. In other words, video is not the best testing format for new companies with limited budgets. The auto-play function provides an excellent opportunity to catch your user’s attention. And best of all, you can also use a performance model here as Facebook will only charge you if your video was viewed for at least 10 seconds, while with Twitter you’ll only pay if the video was 100% in-view on a user’s device for at least three seconds. Deeplinking is the technology that connects different mobile environments (app-to-app and mobile web-to-app), while allowing the opening of a specific app screen. Linkage is a non-issue on the web but on mobile it certainly is with lots and lots of broken user experiences. For example, imagine you’re scrolling through your Facebook newsfeed and you receive an invite from a friend to play a game (Farmville, CandyCrush, whatever floats your boat). The invitation promises some type of reward i.e. 10 free coins, or all new powers, etc. If you want to create a seamless experience for your user, you need to make it as easy as possible for them to cash in on that promised incentive. Deep links allow you to bring users to a unique landing page within your app enabling them to cash-in on their freebie. There are two ways you can use this feature on Facebook, one being through App Links, Facebook’s deeplinking tool, by following these implementation methods. 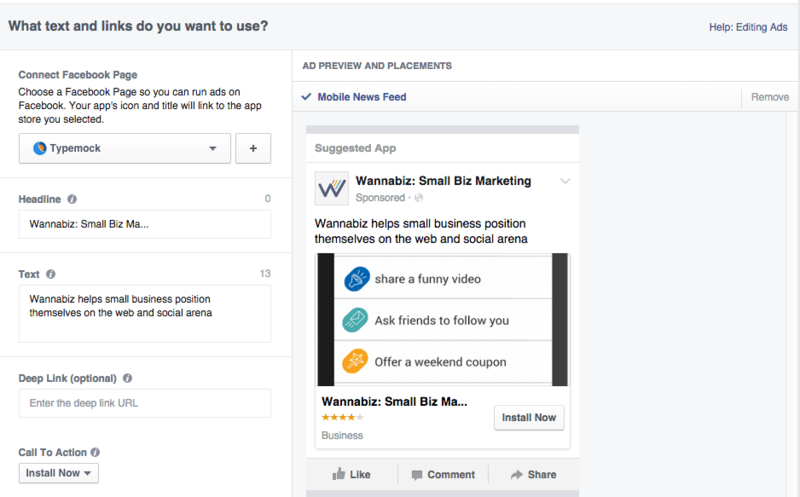 If you haven’t enabled App Links, Facebook has created a new field in their app creation tool allowing developers to define the exact location they want to link their ads to. Twitter enables deeplinking as well as allowing users to tap a link in twitter and end up on the specific page within the given app – if they’ve already installed it on their device. If not – they’ll be taken to the app store to download it. In order to enable the deeplinking feature on your Twitter ads, you’ll just need this new set of markup tags. It goes without saying that if you want to become a super ‘social on mobile’ marketer, you need to measure your efforts. And do so tirelessly. 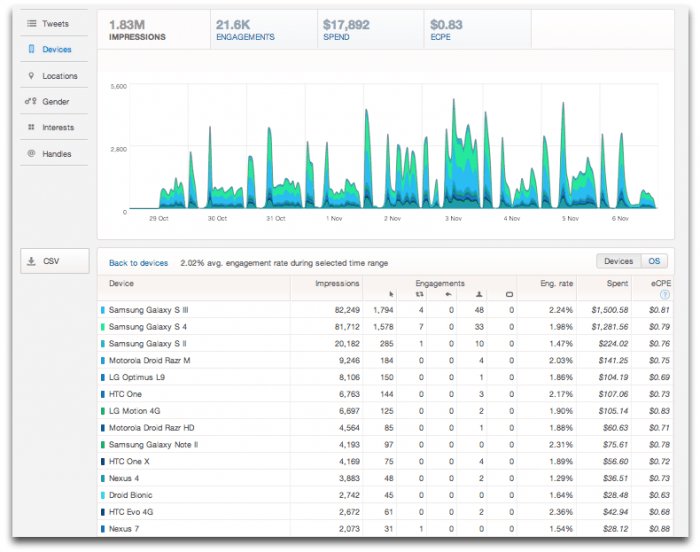 You can either use the social networks’ analytics dashboards to understand what’s working and what’s not, or an analytics partner to get advanced functionalities like retention and cohort reports, multi-touch attribution, enhanced lifetime value analysis and comparison to multiple marketing activities across hundreds of media sources. It is important to stress that the only way to measure campaigns on Facebook and Twitter is by either integrating their SDK in your app or the SDK of its official mobile measurement partners (here’s the Facebook list, and here’s Twitter’s). Facebook has also announced that as of November 4th, 2015, advertisers will no longer have access to device level data from app install campaigns running on the social network. That means the only way to use this data in your Custom Audiences campaigns is by working with a mobile measurement partner that can transfer this rich in-app event data to Facebook for this purpose. Mobile has taken the popularity of social networks to a whole new level entirely. Social engagement on mobile is dominating digital today, and this includes advertising – because it’s native, it’s video and it’s based on amazing data that leads to super sharp targeting with capabilities unique to mobile devices. When advertisers across the board embrace deeplinking to create unified user experiences and analytics to generate smart, data-driven decision making, the potential will be met in its fullest. About the Author: Ran Avrahamy is the Head of Marketing at AppsFlyer.com. Managing a complicated relationship with mobile. (Too) early adopter. Loves being an entrepreneur – Hates the word entrepreneur.